Since each life is unique, we strive to help arrange a meaningful and fitting tribute that reflects each person's individuality. Examples include memorial DVD's, memory boards, display of personal possessions, favorite musical selections, social media, and much more. You will receive exceptional service and our undivided attention and care. It is the "extras" that we do that set us apart from other funeral service providers. Examples include picking up incoming relatives at the airport, floral photos, flower delivery after the service, house sitting, concierge services, dove and balloon releases, catering/reception planning, cemetery memorial consultation, and assisting families with veterans' benefits, insurance forms, or other difficult paperwork. Yes, we are a small-town, family operated funeral home supported by a wonderful community, but no funeral is too big or too small to be serviced with the exceptional care and planning you deserve. It all began around 1923, during the time of the Warren G. Harding administration and the year of the first baseball game ever played at Yankee Stadium, that James Morrow opened for business the James K. Morrow Funeral Home. 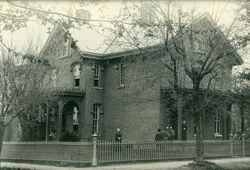 It originally was located on Broadway Street in Granville and later relocated to 121 S. Prospect Street. After thirty-two years of operation, Mr. Morrow sold the business to Lloyd Crouse in 1955. It then became the Morrow-Crouse Funeral Home. From the start of Lloyd’s proprietorship as owner, the business was moved to the present day building at 133 S. Prospect Street. After working with Lloyd for several years, J. Rodney and Deborah McPeek purchased the business in 1973 serving Granville and surrounding areas for over 35 years. In 1983, at the age of 16, Bill Hoekstra began working for the McPeeks answering phones. Over the years, Rod became a mentor and friend to Bill. It was through Rod’s example, direction, and guidance that Bill pursued a career in funeral service. It wasn’t until a couple years after the untimely death of Rod that Debbie sold the business in the hopes of semi-retiring enjoying golfing, spending time with grandchildren, and traveling. In 2007, Mary and Bill Hoekstra were given the opportunity to purchase the family business with the continued help and support of Debbie. 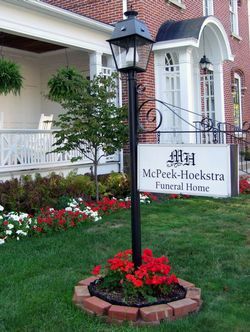 It is with great honor and dignity that we maintain the McPeek name in our business as we strive to continue to maintain the reputable, outstanding service provided by the McPeeks for over three decades.